Intracardiac infection involving mural endocardium and non valvular structures is uncommon in infective endocarditis. The mural endocarditis is usually associated with valvular vegetations, high velocity regurgitant jets, pacing leads and other artificial devices and congenital shunts. It can be seen in all cardiac chambers and may result from hematogenous seeding or direct spread of infection. If not diagnosed early, it usually causes significant cardiac morbidity and mortality. A 10-year-old female presented to us with the 4 months history of continuous fever and increasing dyspnea New York Heart Association (NYHA class-IV) for last 1 month. She was a known case of rheumatic heart disease with severe mitral regurgitation and had a history of hospitalization for heart failure 6 month back. On physical examination, her pulse rate was 110/min with the blood pressure of 100/70 mmHg. The jugular venous pressure was raised and mild pallor and splenomegaly was present. The chest examination revealed the presence of bilateral fine crepitations and cardiovascular examination showed the presence of a harsh grade IV/VI pansystolic murmur with radiation to axilla and a loud third heart sound at the apex with an early diastolic murmur at the left third intercostal space and loud pulmonic component of the second heart sound. Her blood examination showed leukocytosis and raised erythrocyte sedimentation rate. The chest X-ray Posteroanterior (PA view) showed left ventricular type of cardiomegaly with signs of pulmonary congestion. 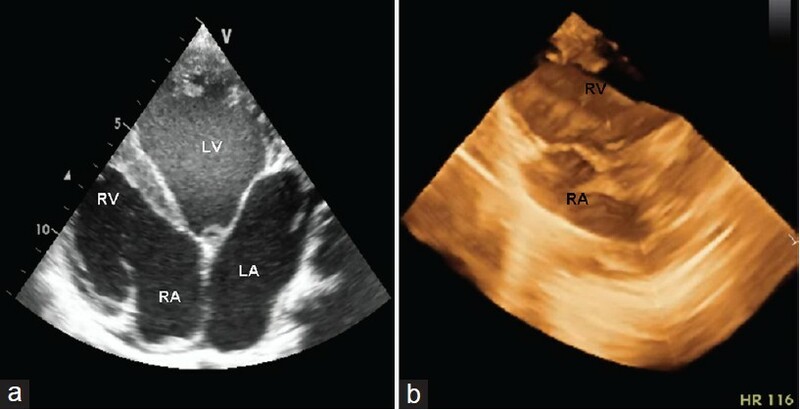 Two-dimensional transthoracic echocardiography examination in apical four chamber view showed the presence of dilated left atrium and left ventricle with a circular 16 mm × 18 mm mobile mass attached to the basal right ventricular wall just above the lateral tricuspid annulus [Figure 1]a, Movie clip 1]. Tilted right ventricular inflow view showed multiple balls like opacities in the right ventricular cavity [Figure 1]b, Movie clip 2]. The color Doppler examination revealed severe mitral regurgitation and moderate aortic regurgitation and mild tricuspid regurgitation. Subsequent three-dimensional transthoracic examination in the parasternal short axis view showed two masses of size 14 mm × 16 mm and 16 mm × 1 mm, attached to the basal right ventricular wall [Figure 1]c, Movie clip 3]. The blood cultures from the patient revealed growth of methicillin resistant Staphylococcus aureus. The final diagnosis of right ventricular mural infective endocarditis was made and the patient was treated with intravenous vancomycin along with other measures to treat heart failure. Her fever subsided and a repeat two-dimensional and three-dimensional echocardiogram after 4 weeks of antibiotic therapy and medical stabilization showed disappearance of one vegetation and reduction in size of the other vegetation [Figure 2]a and b respectively, Movie clips 4 and 5]. The antibiotic therapy was continued for 6 weeks and final two-dimensional and three-dimensional transthoracic echocardiogram at 6 week showed complete disappearance of vegetations [Figure 3]a and b respectively, Movie clip 6]. The patient is doing well after 6 months of follow-up with no recurrence of fever. Mural vegetations are very rare findings during the course of infective endocarditis. The diagnosis of infective endocarditis by the presence of mural vegetations without valvular involvement is difficult. Mural vegetations are commonly seen in patients with congenital heart diseases because of impact of the jet stream leading to endocarditis, like in the ventricular septal defect. Chronic debilitating illness, immunosuppression, and indwelling catheters are common risk factors for mural endocarditis. Cardiac tumors, thrombi and metastasis should be considered in the differential diagnosis of mural vegetations. The organisms commonly associated with mural endocarditis include staphylococci, viridans streptococci, enterococci, and fungi. , Urgent surgical treatment carries the advantage of preventing embolization of large vegetations and intracardiac complications, but with the increased risk of uncontrolled sepsis. Three-dimensional echocardiography can better delineate mural vegetations and other intracardiac masses. Our case is a rare case of right ventricular mural endocarditis, where the presence of multiple vegetations was confirmed with two-dimensional and three-dimensional transthoracic echocardiography with unusual and successful response to intravenous antibiotic resulting in complete disappearance of large vegetations. 1. Kearney RA, Eisen HJ, Wolf JE. Nonvalvular infections of the cardiovascular system. Ann Intern Med 1994;121:219-30. 2. Yu PJ, Fordyce M, Srichai MB, Zinn A, Losada M, El-ftesi S, et al. Giant right atrial wall vegetation mimicking cardiac tumor. J Am Soc Echocardiogr 2007;20:1315.e9-11. 3. Ak K, Adademir T, Isbir S, Arsan S. Right ventricular mural endocarditis presenting as an isolated apical mass in a non-addict patient with congenital deafness and aphasia. Interact Cardiovasc Thorac Surg 2009;8:498-500. 4. Zaragoza-Macias E, Chen MA, Gill EA. Real time three-dimensional echocardiography evaluation of intracardiac masses. Echocardiography 2012;29:207-19.